Searching for the best studio apartment can be challenging. One of the biggest challenges apartment hunters have is finding a studio apartment that is the right size. Whether the apartment is too small or too big will totally depend on your needs. How small can a studio apartment be? The smallest studio apartments are around 200 sq.ft. (18.6 m2). 500 sq ft (46 m2) is the average size of studio apartments in the U.S. It can be hard to envision exactly what 200 square feet looks like. For some, it is even harder to imagine how their stuff is going to fit in such a small space. Keep in mind that there are several different layouts of sizes of studio apartments available. Here are some styles of studio apartments and five examples of how the space can work for you. Where Can You Find Open Layout Designs? How Do Open Layout Designs Work? What Can You Expect From A Luxury Studio Apartment? Are There Other Shared-Space Studio Apartments? What Are Some Examples Of Small Studio Apartments? The most common layout you will find for small-scale studio apartments is open layout designs. These are the type of apartments that don’t use wall partitions to break-up the separate areas. Basically, these are large rooms with four walls and a separate bathroom. However, keep in mind that not all layouts will have the bathroom in a separate area. 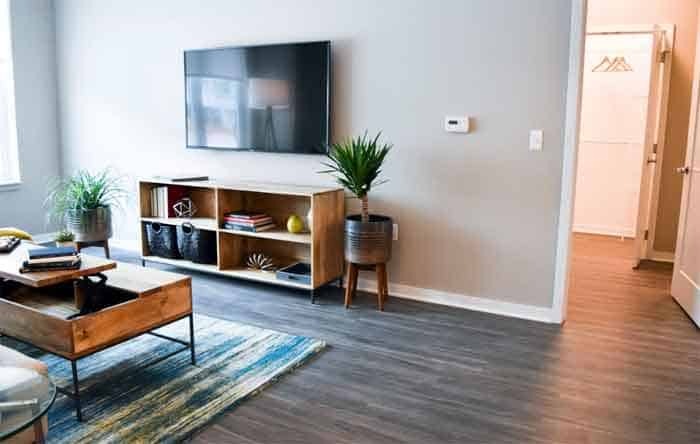 These types of studio apartment layouts are most commonly found in renovated spaces like apartments above a garage or a small-scale complex. Because the area has been converted, there isn’t always enough space to fit in separate living spaces. You can also find open-area spaces in apartments that were once used as office spaces. This is because these types of spaces were originally designed not for private residences. However, these types of open-space apartments are also sought after because of their unique charm. Along with a studio apartment, you are also getting an amazing backstory. Instead of looking at an open layout as a large room you need to fill, look at it like a fun and exciting design challenge. Open layout studio apartments are literally blank canvases to do with what you please. Want your bedroom area to double as an art studio? Looking to use most of the area for entertaining? There is nothing that you can’t do with open layout design, as long as you are willing to get creative and think outside the box. The box, of course, being the four walls surrounding you. The flow of the apartment will completely depend on the general layout. While you can move your sleeping area around, permanent fixtures like kitchen appliances and sinks will always have a set place. One of the reasons why studio apartments are so on-trend is because they offer usable space at a low cost. But, people have found a way to make money from the downsizing trend. Expensive apartment complexes and timeshare condos have been popping up all over the country. This style of studio apartment was geared at people who don’t have a need for large space but who also want to live in comfort and luxury. The one thing to keep in mind about these types of studio apartment is that there isn’t always a lot of room for creativity. This is because while the buildings may change, the layout design is typically the same. The average layout out of luxury studio apartment is an entryway that leads directly into the kitchen. The kitchen is usually a gallery style hallways kitchen that has a breakfast bar. From the breakfast bar, you will be able to look out at the rest of the apartment. The large shared space is where you will be doing your entertaining as well as sleeping. The one major thing that luxury style apartments offer is storage space. This means along with a closet, you can find extra storage units located outside of your apartment to keep things. If you are willing to pay the price, expensive studio condos come with a ton of amenities. Extra perks like parking, gym facilities, and on-site laundry are a huge advantage to renters. Just remember, the more perks a rental has, the more money you will have to spend. On the complete opposite side of the scale are shared space studio apartments. Unlike luxury style condos, these types of apartments are on the lower end of the rental fee. This is a great option for singles, students, and people looking to save some money. While these apartments have all the basics you need to live comfortably, they are not always great for long-term stays. This is because of one major factor; the bathroom. Buildings that have multiple shared-space units generally have only one or two bathrooms per floor. This means that you will be sharing a bathroom with your neighbors. While this doesn’t do much for you when it comes to privacy, the savings you will be getting are huge. These types of apartments use the same thinking that you see in dormitory-style living spaces. The idea is that each person has their own sleeping, living and cooking space, but the bathrooms are shared. If you are really looking to commit to the shared–space lifestyle, there is a way to take it a step further. There are apartment units that not only share a bathroom space but a living and kitchen space too. This is almost like a “nicer hostel” type of living. For people who have taken their downsizing to the extreme, this could be a great short-term option. Generally, this type of dwellings is geared at people who don’t mind sharing with the neighbor. This can include kitchen utensils and other general items. This can help to cut down living costs significantly while embracing that communal lifestyle. When imagining yourself in a small studio apartment, it is easier for you to visually see it. There are plenty of resources that show examples of how some people have made a small space livable. User-based platforms like Airbnb and Pinterest are a great way to see examples of layouts for studio apartments. This is also a great way to see how others have creatively used their space. Here are five examples of small-scale studio apartments so you can begin to better visualize what it might be like living there! This Seattle studio apartment shows what can be done with such little floor room. This studio apartment is on the smaller end when it comes to size. The apartment is confined to one room. However, the way the apartment was styled makes it feel luxurious and spacious. Instead of having an entryway that opens to the kitchen, the entry of this apartment opens right up to the sleeping area. Directly parallel to the sleeping area in a small kitchen area. The reason why this apartment feels clean and open is that it is fitted with high-end appliances. This San Diego studio apartment is an example of a small home that was converted to studio units. This studio is very small but feels open because of the bright colors and natural light. This layout has you enter right into the sleeping space which shares a room with a small kitchen. Unlike the last studio apartment, this one features only small appliances that were specifically designed for smaller spaces. This way there is more floor room and more room for entertaining. The one smart design move in this unit is the use of mirrors to make the room appear bigger. This classic Brooklyn walk-up studio is located in a renovated brownstone townhouse in the center of New York City. Brownstone townhomes are classically New York. These historic looking buildings are constantly being converted in studio units. This is because with space being so limited in the big city, classic units like these are in high demand. The layout of this studio apartment slightly differs from the others in that there is some room between the sleeping and cooking areas. The one great thing about this style of the studio apartment is that it stays true to the features you would want from a brownstone. They have highlighted the original features like the metal fireplace and the open natural light. This trendy studio shows you a different example of studio layouts that have more space to offer. Located in the trendy downtown district of Ann Arbor, this studio shows how you can still get some privacy, even in a small amount of space. This is done by having a partition wall between the entertaining space and the sleeping area. While the unit is still open, this little extra bit of the wall makes it feel like there is a separation of space. Also, because this is a luxury apartment complex, you can expect amenities. This clean studio apartment in Miami shows you how you can live comfortably with just the bare-bones. What makes this layout different is that the galley kitchen is set to the side of the apartment. This helps to make it feel like it is a separate room without any closed-in walls. Also, since there is no designated eating area, the owners used small but high, dining furniture to fill the space. This helps the apartment to feel much bigger than it is. Another important thing to note is that by keeping the design minimal, every feature has a purpose. This is one of the most important things you can do when looking to downsize your life. We have collected ALL the best interior ideas we have found for studio apartments here. A studio apartment is much more than four confined walls in a small amount of space. There are so many unique layouts and designs that you don’t have to feel like you’re living in a box. While 200 square feet barely feels like enough room to move, it is actually more than you need. Go here for more information on what qualifies as a studio apartment. With the right amount of planning and perfectly places furnishings, your studio can feel massive. So, the next time you tour a studio apartment layout, keep an open mind! There is nothing that you can’t do with the right amount of imagination and creativity. Good luck.